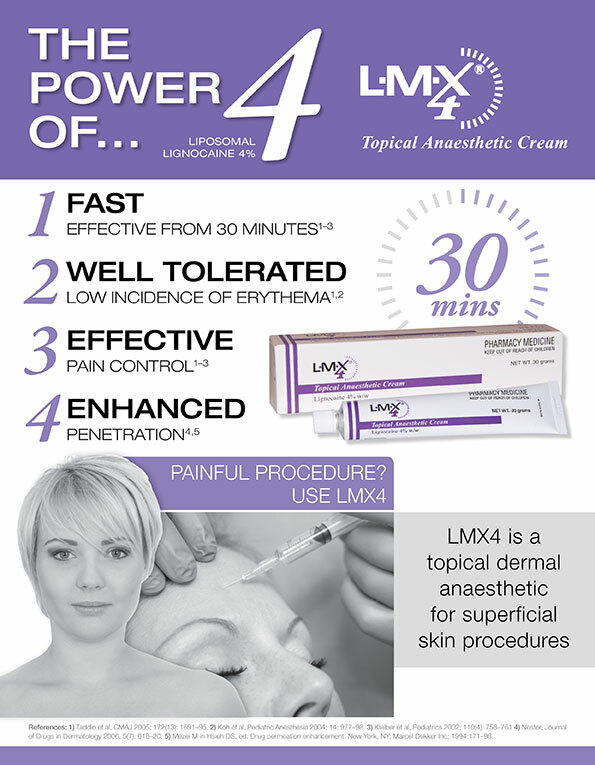 LMX4® is a brand name for a topical cream that contains an anaesthetic called lignocaine in a strength available over the counter at your pharmacy. The active ingredient in LMX4® is 4% lignocaine. It also contains benzyl alcohol 1.5% as a preservative. What is lignocaine used for? Lignocaine preparations are commonly used by physicians and other health care professionals to numb the skin prior to performing cosmetic procedures, obtaining blood specimens, and other such procedures. LMX4® is indicated for skin procedures, including insertion of IV catheters and blood sampling for adults and children 2 years of age and over. Visit www.lmx4.com.au for further information. References 1) Taddio et al, CMAJ 2005; 172(13): 1691–95. 2) Koh et al, Pediatric Anesthesia 2004; 14: 977–82. 3) Kleiber et al, Pediatrics 2002; 100(4). 4) Nestor, Journal of Drugs in Dermatology 2006, 5(7): 618–20. 5) Mezei M in Hsieh DS, ed. Drug permeation enhancement. New York, NY: Marcel Dekker Inc; 1994: 171–98.